Trojans Coach Ed Kirkwood was disappointed his team had to face their top rival during spring break, but it worked out for the boys. Kirkwood called it. He said on paper that his boys “would be close.” It was — and the Trojans squeaked by the Faith Lutheran Crusaders on their home turf 74-71 on Wednesday afternoon. 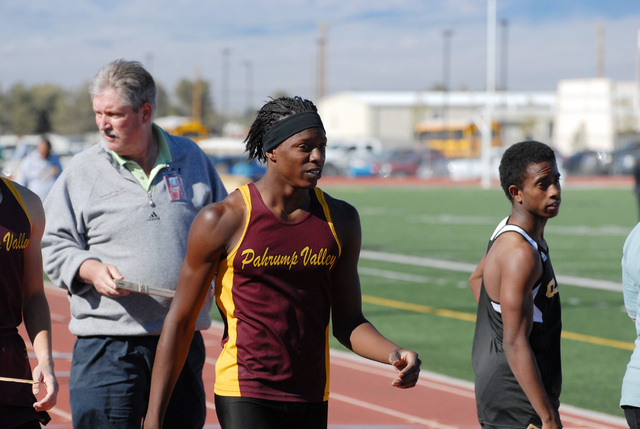 The Trojans turned to their work horse Devon Montgomery, who surprised people with his speed in the 100-meter dash and was able to eke out an 11.29 for a second place to Faith Lutheran’s Mark Rubalacaba, who only beat Montgomery by 1/10th of a second. Montgomery then went on to win the 400-meter run (52.81) and took second in the discus (104-3.75). In a strategy move, Kirkwood took Montgomery out of the 110-meter hurdles, an event he would have won easily, and moved Montgomery over to the 100-meter dash because sprinter Keenan Harris is still out. This gave the Trojans points instead of being swept. This move gave the Trojans the edge they needed for the win. Kirkwood knew Faith was weak in the hurdles. Michael Carlson easily had good enough times to take first in the 110 and the 300-meter hurdles. This was a gamble for Kirkwood that paid in gold for Montgomery has made huge strides as a sprinter in the hurdles. A month earlier when Harris got hurt the coach said that moving him to the 100 wouldn’t work because Montgomery’s time for this event was in the high 11s — surprise coach. Kirkwood said he sat down with Coach Jill Harris and talked about moving Montgomery. Field events came through and also made a huge difference with Pahrump taking first in the high jump, the pole vault, long jump and the triple jump. Devlin Dylan (5-8), Isaac Davis (5-6) and John Clark (5-2) swept the high jump. In the pole vault, it was Nico Cipollini (11-6), Jacob Stearns (11-6) and Michael Carlson (10-00) with the sweep. Davis (17-05) and Dakota Sanders (17-00) took first and second for the long jump and it was Davis (38-02) again in the triple for first and Clark (36-01) for third. The Lady Trojans track team were missing too many girls to make a good showing due to the spring break and Kirkwood knew this going into the meet. The girls lost 90-50.